Running can be tough on the body. Not only is it extremely taxing on muscles, but the repetitive pounding for mile after mile means the joints take a hammering too. For a runner to improve, it is vital that he gives his body a chance to recover from such exertions. Those runners keen to take a day off from running without taking a day off from exercise may want to add swimming to their training programme. Swimming is ideal as a cross training activity for runners. Both sports will improve cardiovascular fitness and mixing the two can result in improved overall endurance for each sport. By swapping the high-impact pounding of the streets for some low-impact exercise in the pool, a runner can give his hard-worked joints a well-earned rest. Recovering is key if a runner is to improve, and swimming can be a form of active recovery. Muscles will heal more effectively too and this will allow them to train at a higher level the next time you go for a run. Repeat this process of stress and recovery and improved physical performance will follow, leading to faster times. Adding variety to a training programme, with the introduction of a very different activities such as swimming, can improve a runner’s psychological outlook too. Getting out of the rut of pounding the streets for mile after mile and into a weightless, low-impact environment can result in a better mental take on training and lead to more enjoyable training sessions. A one-mile swim is roughly equivalent to a four-mile run, but it obviously depends on how hard you are working to cover the distance. Swimming has other benefits, of course. It gives runners, who do the bulk of their work with the lower body, a more demanding upper body workout and improves breathing technique. It’s also relaxing, cooling and stimulates blood flow to sore or tired muscles. Runners can often have tight muscles and swimming should improve flexibility, as limbs need to be long, loose and extending out of free joints for swimming. The range of movement of any joint is greater when supported by water. Suppleness reduces the risk of injury and may improve your running style. 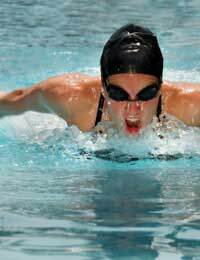 Swimming can be a great way to maintain aerobic fitness for those unable to run due to injury. Movement in water is seen by physiotherapists as a useful part of the therapeutic process for patients recovering from injury. Working against the resistance of the water builds muscle and gives you a cardiovascular workout but it should also relax you at the same time. Those new to running may want to lose weight and swimming can be the place to start. This is because in order to burn fat, exercise must elevate the heart rate continuously - but within our aerobic limits - for a few times a week. Twenty minutes of gentle breaststroke may elicit a heart-rate of 120 beats per minute while feeling like a stroll in the park, but runners know it’s very difficult to keep your heart-rate this low on a run.